Ricky Arnold, of Arnold’s Towing pulls the car from the water. 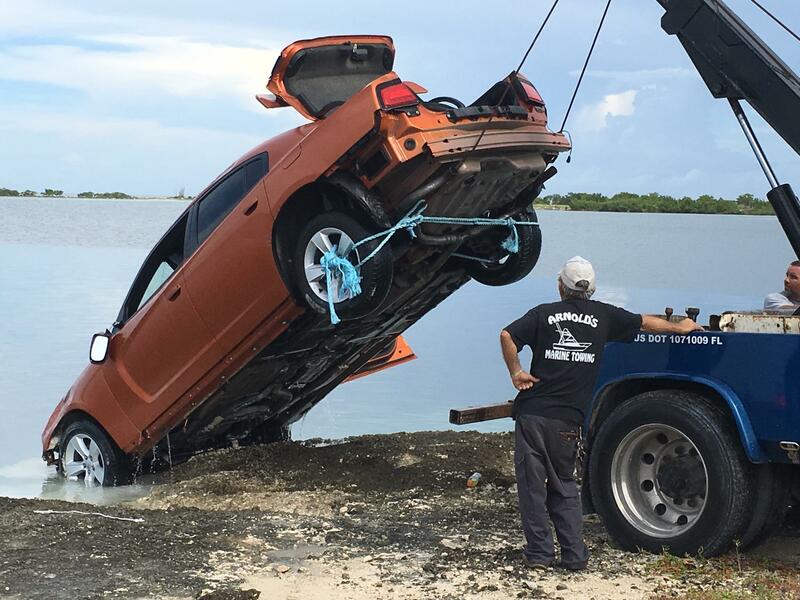 A car, stolen from Stock Island overnight, was pulled from the water near the intersection of Riviera and Puerta Drives on Rockland Key. Sheriff’s dispatchers received a call at 5:30 a.m. from a resident of that area who said he saw two or three young men estimated to be in their 20s run away from the scene after the vehicle went into the water. When deputies arrived, they ascertained there was no one in the car, then called for a tow truck to remove it from the water. The owner of the car told deputies she forgot to remove her keys from inside the car the night before. She said she last saw the 2011 Dodge Charger at 11 p.m. She didn’t realize it had been stolen until she woke up and looked outside this morning. Anyone with information about this crime should contact the Sheriff’s Office at 305-292-7060. Callers who wish to remain anonymous can call Crime Stoppers of the Florida Keys. If a Crimestoppers tip leads to an arrest, the caller would be eligible for a cash reward. The Crimestoppers hot line number is 1-800-346-TIPS. Tips may be made anonymously on line at www.tipsubmit.com or via a text message to 274637 using the keyword TIP136. Something tells me there is more to this story. Anyone knows Stock Island is a high crime rate island. How do you forget to remove the key out of a desired car like a Charger.